Public unsupervised for-fee parking in Tallinn breaks down into the following parking zones: City Centre, Downtown, Old Town and Pirita. Parking zones on the online map of Tallinn. The City Centre parking zone is bounded by the Bay of Tallinn, Kalasadama tänav, Põhja puiestee, Kotzebue tänav, Kopli tänav, Telliskivi tänav, the railway, Filtri tee, Odra tänav, K. Türnpu tänav, J. Vilmsi tänav, Gonsiori tänav, Rohelise aasa, L. Koidula tänav, J. Poska tänav, Narva maantee, Bensiini tänav, Pikksilma tänav and the Bay of Tallinn. Free of charge on Sundays. The Downtown parking zone is bounded by Vabaduse väljak, Kaarli puiestee, Toompuiestee, Tõnismäe, Pärnu maantee, Liivalaia tänav, Pronksi tänav, Jõe tänav, Ahtri tänav, Mere puiestee, Viru väljak, Pärnu maantee and Vabaduse väljak and is located within the Rannamäe tee 1 car park. The Old Town parking zone is bounded by Toompuiestee, Kaarli puiestee, Vabaduse väljak, Pärnu maantee, Viru väljak, Mere puiestee, Rannamäe tee and Toompuiestee. The Pirita parking zone lies within the car parks at Merivälja tee 1c and 1e. If the driver of the motor vehicle has recorded the start time of parking in writing or using a parking clock on the windscreen of the vehicle in a visible area, the liability to pay a parking charge shall arise after 15 minutes pass from the time parking begins. The driver of a motor vehicle must pay the parking fee either before or shortly after setting the parking timer. To be able to park free the first 15 minutes, the beginning time of parking must be marked. In order to do that, drivers are advised to use a parking timer with two pointers or writing the beginning time of parking down on a piece of paper. 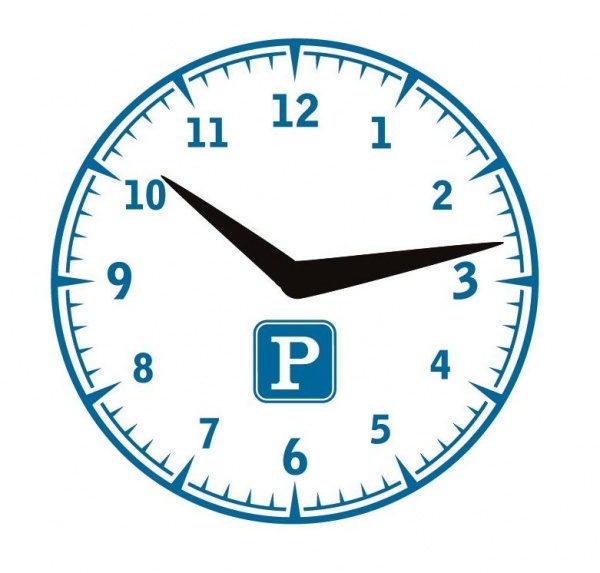 A parking timer with two pointers should be used according to the work principals of a mechanical clock, which means that when reading the marked time, the position of both pointers is assessed. The hour pointer should be positioned on a certain number only in case of full hour. The minute pointer of the parking timer should be positioned between the last and the next hour just as the clock shows minutes. Setting the time on the parking timer with pointers should not be done according to the work principals of a digital clock. Before leaving the vehicle, the driver must make sure the parking timer or a paper slip is visible from outside the vehicle. If the driver has not marked the beginning of parking by setting the parking timer or displaying the time on a piece of paper, the liability of parking fee is applied right at the moment of parking. NB! 15 minutes of free of charge parking applies in the for-fee parking area in Tallinn only – IT DOES NOT APPLY IN PRIVATE CAR PARKS!